If you’ve looked all over the place for the ideal camera rig, but then you realise that you have to either a; hike with it or b; travel with it, as well as carrying a tripod, you’ll soon realise that something will have to give. This was my predicament until a few months ago, when I realised that I could simply break down a Manfrotto tripod and re-rig it to fit my needs. Up until then I’d used a tripod to steady up some shots, by either bracing the legs against my shoulders or just shooting while holding it out in front. I’d also been experimenting with using bungee or shock cord, to help stabilise and hand hold cameras for long periods. 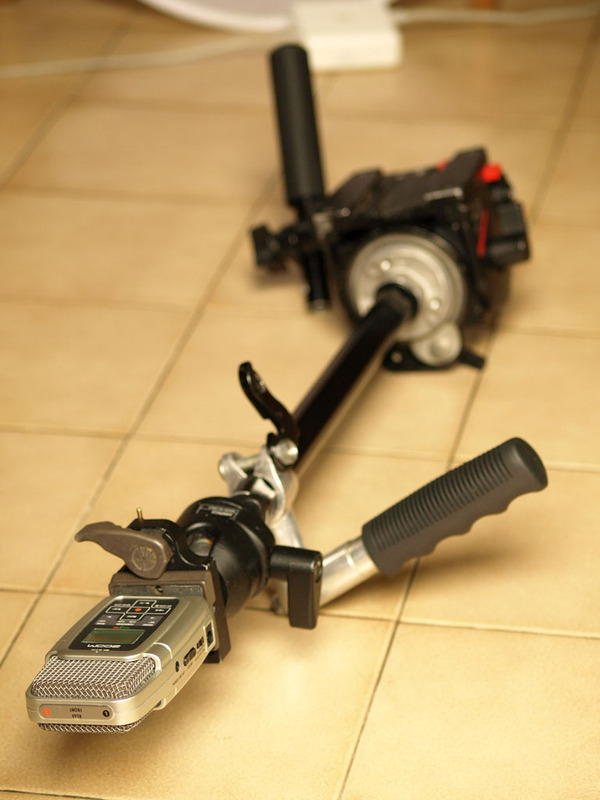 The original steadicam was based around the use of bungee cords, so this is nothing new. It was only recently that I put 2 and 2 together and came up with 101 different uses for a tripod and had to check myself! The first and most simple option is to put the tripod on your shoulder and tilt the head until the camera viewfinder is close to your face. This works to a point but it’s not exactly what I’d call ergonomic. 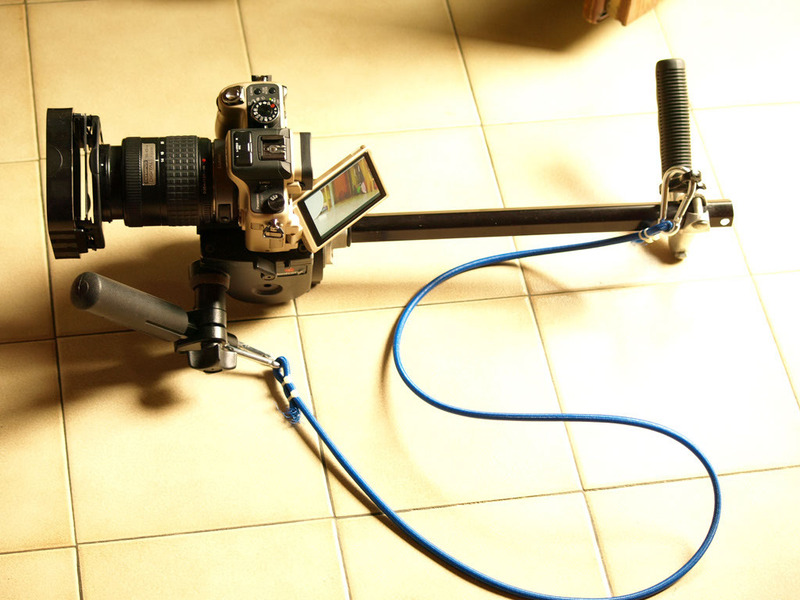 Modify the idea slightly and you can start with a shoulder rig that’s really well balanced for a DSLR. So here is a very simple guide to building a handheld and modular DSLR rig that doesn’t involve going near a DIY store or welding sticky back plastic to your mums old pram. 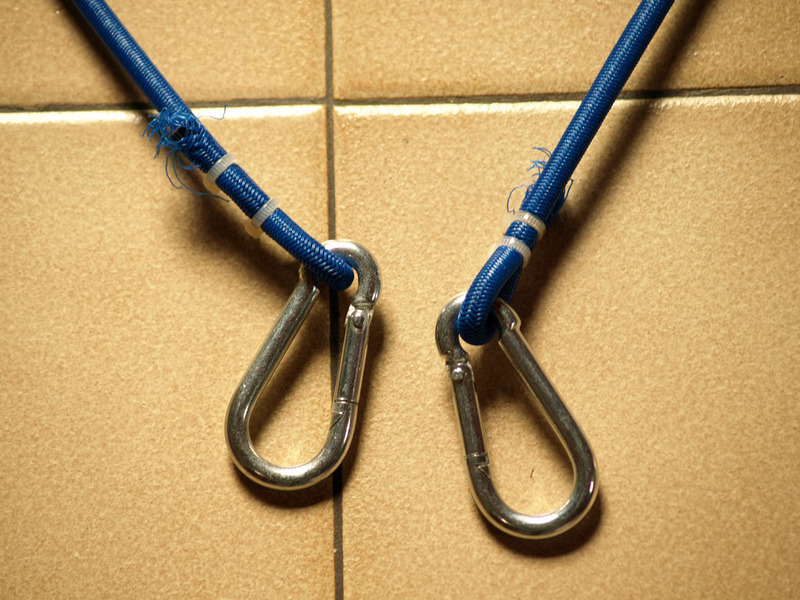 DISCLAIMER: If the bungees snap or you use the hooked luggage straps that you can buy in the corner shop and these come loose, I can’t be held responsible for what happens. YOU POTENTIALLY COULD HARM YOURSELF OR YOUR CAMERA DOING THIS. Make sure that you check, double check that all connections you make are secure first! 1. Tripod with removable centre column. 2. Fluid head with pan bar handle ( an additional handle will make it more versatile ). 5. A couple of meters ( or yards ) of Bungee or shock cord of at least 6mm. 9. Some bike handle grips, make nice additional touches and again help to make the set up more versatile. Remove the centre column with head already mounted. Tilt the head fully back ( on this old 501 head, it’s only possible to tilt through the whole 90 degrees in one direction ). If you are using a head like this, then you will need to mount the camera in reverse on the quick release plate, so that it’s facing forward when mounted. You will need to adjust the plate backwards and forwards to suit your set up. Tilt the pan bar handle down. Add the other pan bar handle to the other side, so that you can have a pair of handle bars if you want. Add the stub into the other end of the column. You don’t need to do this, but it does mean you can add a ball head or superclamp to this end, which helps with both the balance of the support and allows you to attach other equipment. I’ve got a ball head and Zoom recorder mounted in this picture to demonstrate. With camera mounted on the column like this it’s very comfortable or me to bring the EVF in close to my eye, without cricking my neck. It also means you can go from tripod to shoulder mount very quickly. Nice. Invert the pan bar handle so it’s facing upwards. Attach a bike grip to the end of the centre column. You could also mount a pan bar to a clamp at the end if you want. Make up some various lengths of shock cord as shown here. Using bike gear parts makes for nice extra attachment points, but you can use other parts here. Attach the cord using karabiners at the front and the back of the rig. If you’ve attached a sling, then this just goes over your shoulders. Other wise attach the two cords to your harness. It’s NOT a Steadicam, but it does make long periods of handheld shooting comfortable and it is amazingly versatile to shoot with, allowing the camera to be shot both from the hip ( being stabilised by the bungee ) and shoulder mounted. Switching back to tripod shooting only takes a matter of seconds by quick release, or less than a minute if you’re repurposing one tripod head. The important part here is to experiment with cord lengths and thickness, as you need to avoid too much bounce and stretch. 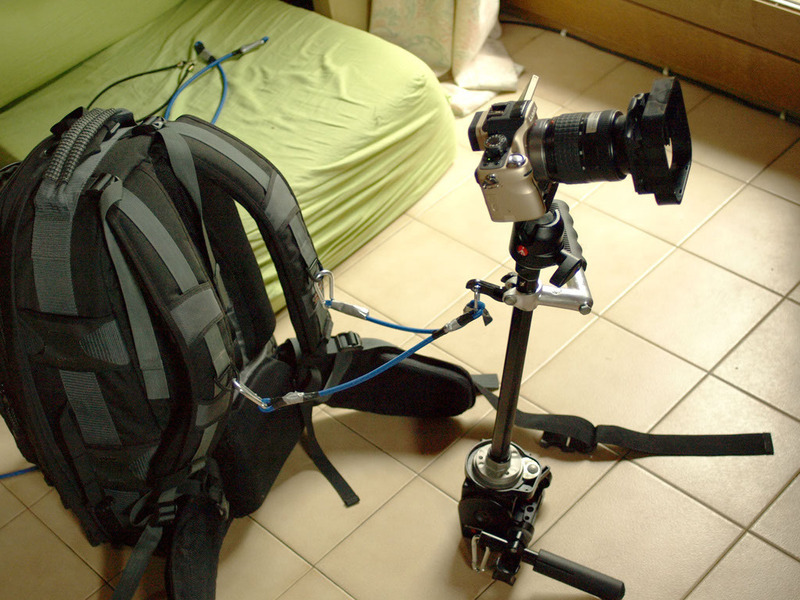 This set up also allows the camera to be moved with one hand when shooting from the hip, as the bungee cord supports the rig and is stable enough to allow this, while the other hand takes care of focus/zoom/set ups etc. Here are some stock car clips, all from the hip and shoulder mounted with mostly long lenses ( 200-300 EFL ). I’ll update this with a more comprehensive video later this week. This entry was posted in Documentary, Equipment, News, Technique. Bookmark the permalink. 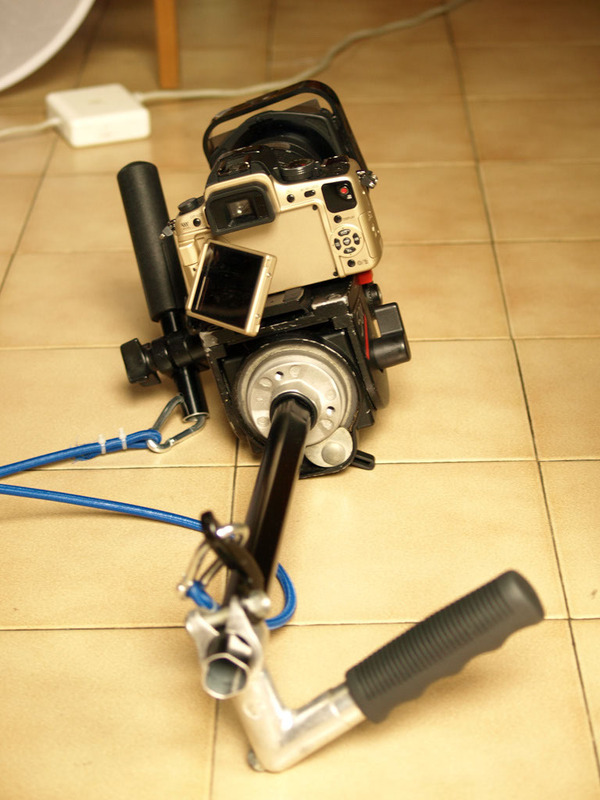 Looks like an innovative solution for DSLR rigs. Very innovative!